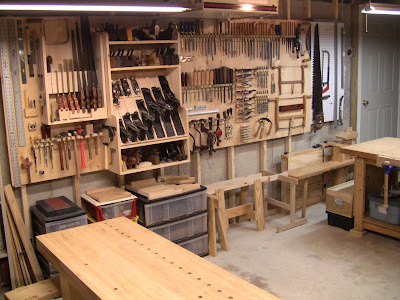 A hand tool workspace is very simple to set up, requiring as little as 4'x6'. More room is better of course, but you can setup almost anywhere. The only power requirements are for lighting. You can use a corner of a garage or basement, a porch, a backyard storage shed, even a spare bedroom, since there's less noise and dust than with power tools. You can also use a portable setup and work under a tent or tarp, or completely out in the open. 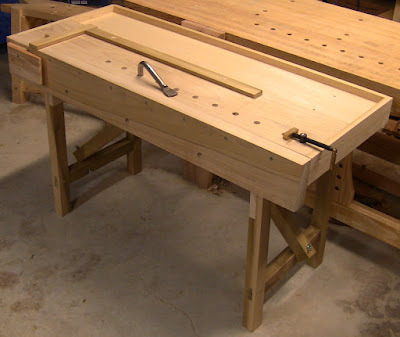 The characteristics of a bench for hand tool work are driven primarily by the requirements of planing. If you have a bench that allows you to plane comfortably, you can do any other operation on it. It needs to be the right height (most modern benches intended for use with power tools are too high), it has to be stable enough to resist the forces of planing, and it has to be able to hold the workpieces in several orientations. Work-holding features will affect your efficiency. Simple work-holding allows you to work quickly. Complex work-holding takes more time. Height is personal, sized to you. Different authors vary on the exact relative dimension, but in general if you stand next to the bench with your arm at your side, the bench top should be between your knuckles and your wrist. It also depends on the planes you typically use; metal-bodied planes tend to be an inch or two lower than wooden-bodied planes. When the bench is the right height, you can get over your planes with your upper body as you work, so you can use body mass to move them, not just your arms. Too high a bench means your arms are bent while planing, and they'll tire quickly. Too low means you're working bent over, which will give you a sore back. Stability comes from good structural design and from mass. Poor structure means the bench will rack and vibrate as you plane. Even with a solid structure, if the bench is too light it will move around. In general, the more massive, the better, unless portability is a requirement. A light bench can be braced up against something or secured to a wall or some kind of anchor to keep it in place. There are many workbench designs. Realize that each is a compromise in one way or another, due to conflicting requirements. A bench that's perfect for one operation will be less than ideal for others. Here are examples of large and small workbenches, and a portable work surface. You can read more about building the first two here: My Roubo and Portable Workbench. 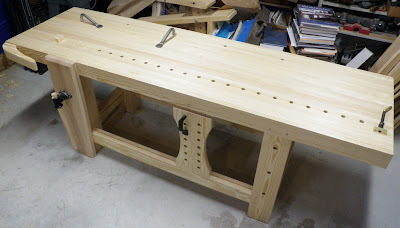 Large Roubo-style workbench, with leg vise, crochet, sliding deadman along the front, planing stop, and Veritas Wonder Dog in place of a tail vise. Two Gramercy Tools holdfasts sit in dog holes. The entire front of this bench is coplanar, allowing the legs and stretcher to act as clamping surfaces. Portable workbench. The legs fold down from the top on hinges, and are secured for use with angled braces. This bench features a frog (similar to the crochet above), planing stop with battens in dog holes, holdfast, and Wonder Dog. The front apron also has dog holes, and can act as a clamping surface. Portable work surface, built from a quarter sheet of plywood. 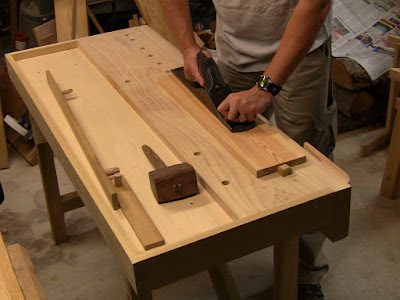 2x4's are screwed to the front and left side to form an apron that hooks over the corner of a tabletop, turning any table into a makeshift workbench. Workholding is provided by modern T-track. The rear batten mounts flat in the tracks. This is for left-handed planing; for right-handers, attach the side apron on the right end. You need to be able to hold your workpieces for face planing both across and with the grain, as well as edge and end planing. Sometimes you'll be planing small pieces, sometimes long boards. 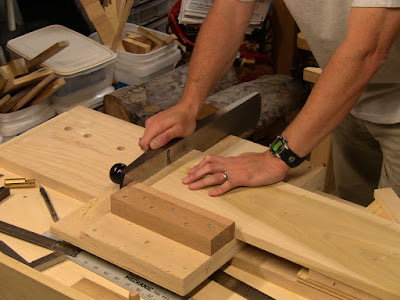 Face planing: You can clamp the piece in place with bench dogs or some type of tail vise, or leave it loose and work it against planing stops. Both methods have their benefits; either way the piece is flat on the bench. 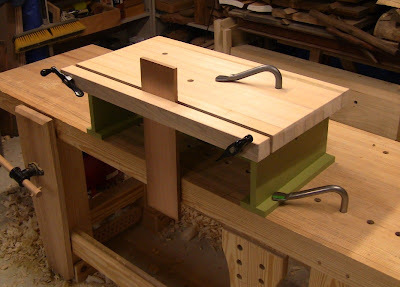 Clamped, the workpiece and bench form a solid mass. You just have to make sure the clamping setup doesn't get in the way of the plane. Using stops, you plane across the workpiece toward the stop, trapping the piece. Some benches just have small narrow stops, so it takes more practice to learn how to direct the force of the plane always toward the stop. Other benches have wide stops, and may have stops in two directions, so you can plane generally into the corner they form. This is easy and fast, no fiddling with any clamp setup. You just have to get used to the workpiece sliding around a bit as you work it. When face planing rough wood, you direct the plane at an angle that can be anywhere from straight across the grain to diagonal. For further flattening and smoothing once the rough work is done, you direct the plane at an angle anywhere between diagonal and straight with the grain. Face planing against a narrow planing stop. The stop raises and lowers to accommodate different thicknesses. Face planing against battens. The planing stop provides one support, while dowels in the battens drop into dog holes to provide the remainder. 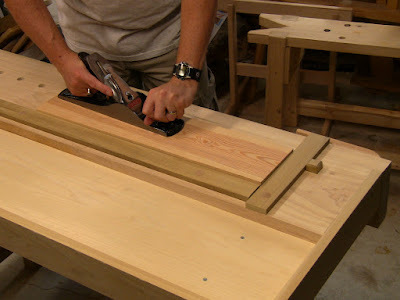 Edge planing: You can secure the work across the front face of the bench, or rest it up on edge on the bench, stopped or clamped similar to face planing. Wide boards generally need to be secured to the front. Some benches have front aprons to accommodate this. Others rely on a thick top, and may have legs or other features coplanar with the front edge, so that they form a large flat clamping surface. 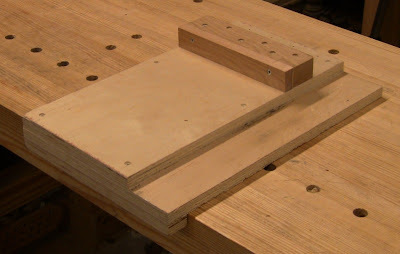 The board end may be trapped in a jam stop such as a frog or crochet, its lower edge simply resting on pegs inserted in the front of the bench, or it may be clamped more securely. Smaller, narrower pieces can be worked easily against a planing stop on the top of the bench once the bottom edge is reasonably square. As with surface planing using stops, this is fast and simple. Edge planing the piece against the planing stop. Edge planing a large piece with the end wedged into the frog, resting on holdfasts or pegs. If the piece wobbles, flip a holdfast up and knock it in to secure it. End planing: You can secure the workpiece standing up against the front of the bench, or lay it down on a shooting board. 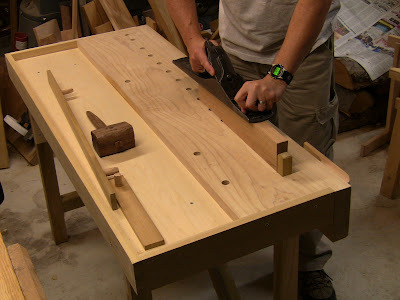 Many benches have a face vise and an end vise, but other configurations are also practical. A leg vise is a large vise that mounts to one of the front legs; the leg forms a clamping surface. There are various front and end-mounted twin-screw vises, where you place workpieces in between the screws and tighten down on each side. A wagon vise is a type of end vise that moves a bench dog against the work, and also provides an opening where you can clamp pieces. Benches will usually have dog holes on the surface and along the front. 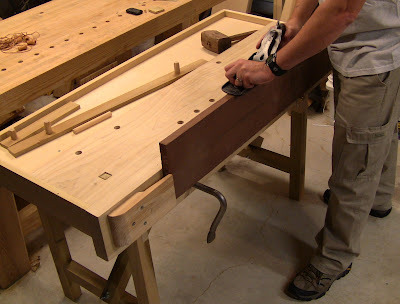 In addition to using bench dogs and pegs in these holes, you can also use holdfasts, a simple and ancient method of holding work. Used on the top, they hold the piece down. Used on the front, they hold it up against the bench. Holdfasts should be of wrought iron or ductile steel, not cast iron, which is too stiff and brittle. Workpiece secured with a holdfast. Bash it down with a mallet to set in place, bash it behind the crook to loosen it. Dog holes will be in line with planing stops and vises to form one side of a clamping setup. Simple wooden wedges can be used to secure a piece between two dogs or between a dog and planing stop. Using opposing wedges to lock a piece in place against a bench dog. The one real compromise with a good planing bench is that it tends to be uncomfortably low for other operations. There are several appliances for raising your work: risers that slide under the feet of the bench to raise the whole thing; smaller auxilliary benches that sit on top of the bench, held in place with clamps or holdfasts; and removable auxilliary face vises that clamp on top. Most of the work-holding methods used for planing will be useful for other operations. Bench-on-bench to raise the work to a comfortable height. 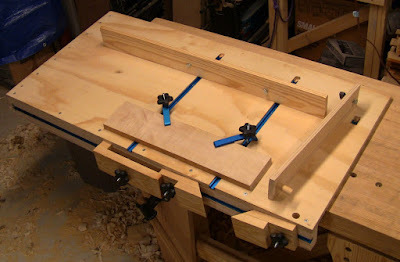 In addition to clamping pieces for joinery, this provides an elevated work surface. 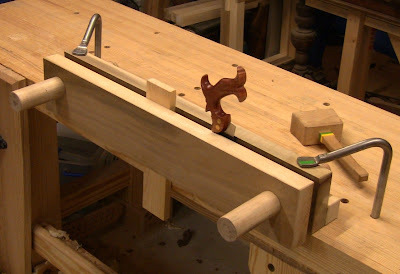 Moxon double-screw vise is another way to hold and raise the work. After planing, chopping mortises with a chisel is the next heavy operation. This requires pounding with a mallet. But a bench robust enough for planing should be sturdy enough for mortising. Again, more mass is better. The two primary appliances for working on a bench are a bench hook and a shooting board. 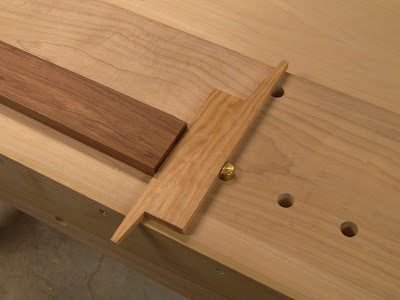 Bench hook: This allows you to hold a piece in place while crosscut sawing, without requiring clamps. It can be used for both rough and fine sawing. It's very simple and crude, consisting of a bed with a cleat on the front that catches the front edge of the bench, and a cleat at the back that stops the workpiece. 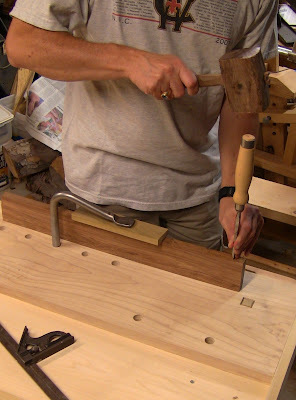 The bench hook in use. Hand pressure keeps everything in place while sawing. Shooting board: This is the precision secret weapon of hand tool work. It allows you to fine-tune the end of a board for angle or length with a plane. It can also be used to plane along the edge of a board; luthiers use this method for book-matching the pieces that form the body of a musical instrument. Similar in appearance to a bench hook, with front cleat and rear stop, it must be built carefully. In addition to the basic 90 degree shooting board for square ends, there are various versions or angle blocks for mitering at different angles. Shooting board. This one allows shims to be placed behind the face of the stop for fine tuning to get the exact 90 degree angle. The shooting board in use. The work is held the same way as the bench hook, while a plane is run on its side across the end. In this way the end of the board can be trimmed one fine shaving at a time for a perfect fit. 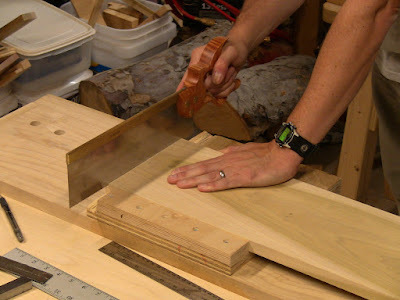 A sawbench is a low bench that comes up to your knee, used when sawing larger pieces of lumber. 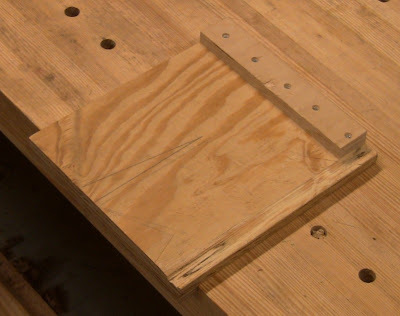 You lay your board flat on the sawbench and kneel on it with one knee to hold it in place while sawing. This puts the work at a good height for powering the saw with your arm. It also allows you to work quickly, because most of the time you don't need to clamp the board. You can use the sawbench for both crosscut and rip sawing, in the space in front of your main workbench. Besides the workbench, this is what defines the minimum workspace you need. As with workbenches, there are a few different styles. Some are designed to make ripping a little easier, supporting the board on both sides of the rip cut as you run the saw down the center of the bench. Sawbenches work well in pairs or with sawhorses to catch the offcut. 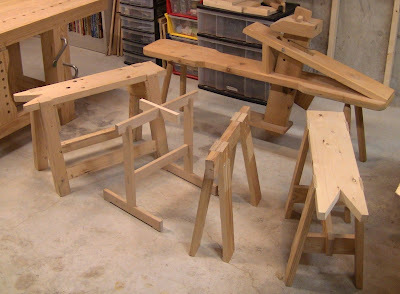 Two sligthly different sawbenches right and left, and two styles of sawhorse in the center. Behind them is a shaving horse, a specialized bench for holding pieces while working with drawknife or spokeshave. Like the workbench, the height of the sawbench is personal. Since it comes to your knee, it also makes a good sitting bench, for sitting at the workbench or sitting on pieces to hold them while mortising. 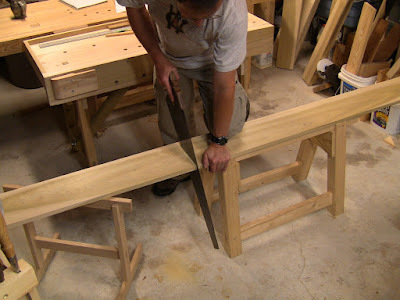 Crosscutting on a sawbench, with a trestle-style sawhorse supporting the other end. Sawhorses are simple work supports. Their narrow top means they must be used in pairs or with other supports. They can be sized to different heights for different needs, or used similarly to a sawbench. There are two popular designs, trestle style, and the classic four legs splayed from the top piece. You need to store your tools in a way that protects them and makes them easily accessible. Disorganization slows you down. Tools also need to be protected from corrosion. This can be a difficult problem in some workspaces that are constantly damp. During the course of a project, you'll need to use a variety of tools. They need to be easily accessible so you can pick them up quickly without having to dig around or search for them. Just as important, they neeed to be easy to put away. This prevents things from piling up. Piled tools are messy, hard to locate, and an accident waiting to happen when something falls, damaging the tool or its edge, or injuring you. I've come to prefer open hanging storage next to my workbench, so that I can reach a tool in a step or two, use it, then put it back immediately. I find it annoying and time consuming to have to walk across the shop or around things, reach over things, and open drawers or cabinets. I also tend to be a piler, so I'm better off not having horizontal surfaces to set thing down on. I prefer to have everything to the side rather than over my workbench, because I have the bench out away from the wall for maximum accessibiliy. Since I have a basement workshop, positioning it near a window for natural light isn't a consideration. Simple hanging panels to the side of the workbench. For damp environments where you may prefer to close them up, hanging cabinets that can be opened up while you work are effective. Cabinets can also be locked to keep small children out. In addition to the wall storage, I use a rolling shop cart with shelves to hold the tools I need for the moment. I model the use of the cart on my wife's job. She's a surgical nurse. In surgery, a patient lying on the operating table is like a workpiece lying on the workbench, and the instruments are the tools. The field of work needs to be kept clear, so all the instruments are laid out on tables and carts; this makes locating them and accounting for them easy. Similarly, this method keeps my workbench clear of loose tools, yet they are right next to me as I work. I just need to clear off the cart as I complete each set of operations so it doesn't pile up. Working with wood and sharp tools, splinters and minor cuts are inevitable. A simple first aid kit consisting of fine tweezers, antiseptic wipes, bandaids, and gauze pads is sufficient for most injuries. Butterfly closures are also useful for larger cuts. The worst injury you're likely to encounter is a deep cut from a chisel that slips and sinks into your flesh. This can be quite serious. Other than wrapping with gauze to control the bleeding, this kind of injury requires professional care. You should also be up to date on your tetanus shot, especially if you use old tools that are rusty. What a fantastic and thorough writeup. Nice work, I will bookmark this one to send to beginners for sure! As a complete beginner myself I'm loving all the free advice. Closegrain is one of my favourite blog / websites. Thank you for putting in the time to share your knowledge & experience. Another great post. Taken away loads of great ideas. I can't wait to start my own.. thanks for the inspiration! Being a newbie, this was great. Thank you for the write up!